The Fastest, Funniest, Most Visual Version of Professor's Nightmare Ever! The ropes change Instantly from short, medium, long to Three Equal Ropes which are still SEPARATE! NO Looping, NO Folding, NO Suspicious Moves. The ropes seem to change all by themselves. It looks like Real Magic! NO Magnets, NO Snaps, NO Complicated Sleight-of-hand. 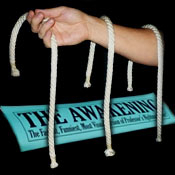 The Awakening is so fast that your audience is more puzzled, amazed and amused each time the ropes change. Includes: Fully Illustrated Instructions with the Professional Script written and performed by Harlan. Specially Selected and Prepared Professional Quality Braided Nylon Rope for visibility and durability.